Most parents are aware that they are building the future in their children. There are those who want to find constructive ways to spend their older years and those of their older family members. Involving both of these groups in fishing can also build the future of fishing. Mature adults and children do not measure the success of a trip by the number of pounds of fish caught. For that matter, studies show that the average fisherman does not measure success by how close to a limit he can get. It is a chance to enjoy the experience in a garden tended by the forces of nature. It is pleasurable to be out in nature and sharing its abundance. Children need that to continue in the sport. Mature adults need to remember those happy days. The true angler speaks of the social interaction with other fishermen and of trying to find the fish as being why they are involved in the sport. Do not place too much emphasis on competition rather than enjoyment of the experience. If the hero is the guy who catches the biggest or most fish it intimidates some children and turns off some adults. They may leave the sport in frustration missing the basics that fishing is intended to enrich. Fishing should provide values that make it a quality outdoor experience. Fishing emphasizes values and experience. We have too much pressure to succeed in our lives. Fishing, if done correctly, can offer an alternative to the high tech and social pressures of daily life. As the day begins to draw down, the angler with the feeling of peace that a good day on the water can provide will continue in the sport. One frustrated by the failure of a new technology to produce desired results misses the point of the activity. He is not really enjoying fishing. He is just adding additional stress to his life. So how does a parent introduce his child to fishing? Or maybe one wants to take a grandchild or neighbor’s kid fishing. Begin by making a big deal out of the planning. Everything about the outing should be fun. Remember that younger children enjoy their activities in short doses. Older people can take it only in short doses. Combine the activities with other fun things such as picnics, playing catch, flying a kite or just hanging out. It is also a good idea that the parent is there to make the experience fun for the child, not the other way around. This is the child’s fishing trip. 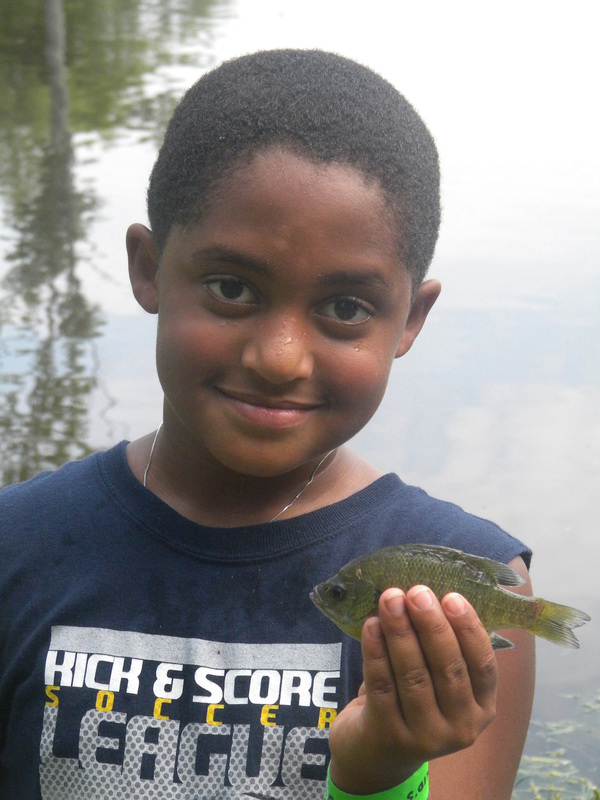 It is advisable that one start a child’s fishing career at a body of water that is not dangerous. A park lake or pond is a good idea. That way if a child should fall into the water, it is not life threatening or otherwise traumatic for them. It is also easier for a parent if he is not constantly stressing about the child falling in the water and drowning. Putting a life jacket on smaller children can be a calming experience for the parent. Make it a game so that the child does not see himself as punished for being little. During the planning stages, it is a good idea to make a big deal out of obtaining the things needed for the trip. It does not have to be costly, but kids will need a rod and reel, a float (bobber), some hooks and sinkers, and possibly a bait bucket and bait. It is not necessary to invest a lot of money in the purchase. Once at the fishing pond, remember your manners and teach them to the child. Do not let them intrude on the fishing of others. 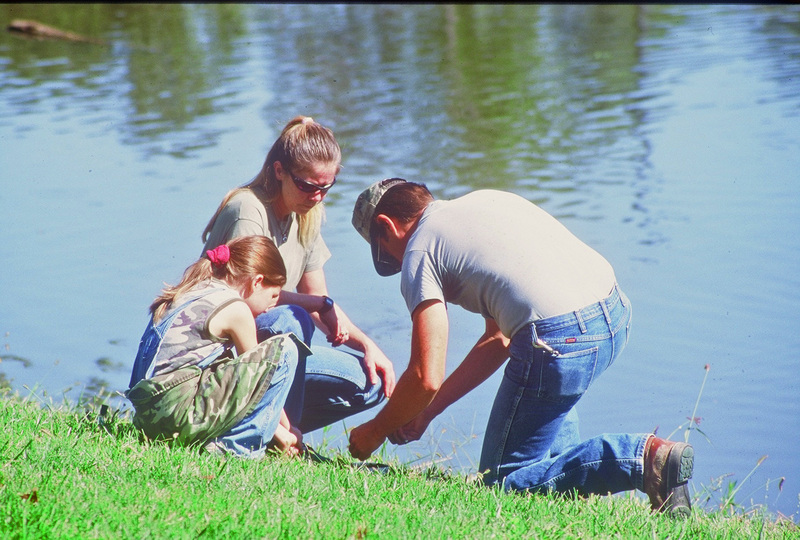 If someone offers to help you with the kids fishing, let them and welcome the assistance. This might be a good time to involve grandpa or grandma. Fasten the float on the line a foot or 18 inches above the hook. Thread or loop a small piece of worm on the hook. You can tell the kids that worms are too dumb to have feelings. Show the child how to flip, cast or swing the rig out into the water. Then let them do it. It does not have to get very far out. You can practice at home in the back yard as part of the preparations. Remember that whatever they do that does not threaten their safety or interfere in the fun of others is OK. Collecting bugs, holding worm races, eating, racing up and down the hill and just about anything that does not disturb others is alright while fishing. So is quitting and doing something else for the rest of the day. Some kids can watch the float all day. Some will want to bring it in right away. It they want to bring it in and cast again, that is alright too. Most anything they want to do is permissible except perhaps eating the worms. If their attention beings to wander because nothing is happening, suggest they try another spot. When the float beings to show signs of activity, you can make a big deal of it. A fish even a little one is a big deal to a child. Once the fish is caught encourage the child to let it go but if they decide to keep it, that is OK too. The decision is theirs they caught the fish. But it is a good time to teach about catch and release as an ethic. If the child wants to keep his fish and take it home for eating, do it no matter how small the fish. It is important to him that he caught a fish and the family will be able to eat it. This is the time for teaching kids about fishing. And a time to relieve past fishing trips with an older adult. The fish are biting and the weather is warming. Winter is over and summer has not quite arrived. Get out with your children or borrow some of the neighbor’s kids and go fishing. Do not have a living grandparent ask a neighbor who does not have a chance to fish very often. It was called playing hooky when you skipped school to go fishing as a child. Later perhaps during working life it might be a sick day or mental health day. When you work for yourself, neither choice is permissible. As an outdoor writer these days become a gray area between work and play. Today is such a day. With two assignments awaiting production, and a lawn needing mowing, a UPS package stands in the corner waiting inspection. It is from Pure Fishing by way of the Blue Heron Communications, friends of the Giudice family and Kevin Jarnagin. The assignments can wait for a day. It rained last night so the lawn needs to dry out. That leaves opening the package. Inside is an ultra-light graphite rod from the new Shakespeare Micro Series of rod and reel combos. A 7-footer, it also has a fully spooled reel of 4-pound line. The reel has a light weight feel and a multi-disc drag system. As a veteran ultra-light angler it came as a surprise just how light and flexible the rod. Included in the bottom of the box was one of the Jar Bait Folders from Berkley. Having used these previously and enjoying the convenience of being able to package up favorite jar baits, some terminal tackle, and piers, conjured up an idea for a trip to the pond in pursuit of bluegill. In a matter in minutes the new rod is undergoing a test of its flexibility and strength on a neighbor’s bluegill pond. A small jig with a couple of Powerbait nuggets produced a few gills. Switching to the Gulp Helgamites and some larger fish were some located little deeper in the water. A leadhead jig helped to get the Gulp offering more quickly through the hungry small fish and down to where the big guys seemed located. The smooth casting of the rod and reel combo, made a cloudy day into a great escape into the world of angling. Although work awaits more important things like fishing can delay it. There is after all, a trout fishing working trip coming up in a couple of weeks on Lake Taneycomo in Missouri. It can prove another test run for the Micro Series rod and reel combo. Waiting out a thunderstorm offered a chance to reflect on the work aspect of tournament angling with Jay Yelas, 2003 BASS Angler of the Year and 2002 Bassmasters Classic Champion. I asked the Team Skeeter and Yamaha Pro Team member what advice he would have for the club tournament angler who wants to become a professional. After a moment of reflection, Jay said, “I think it is important to try to take advantage of the opportunity this country affords.” By that he meant if you have the chance to try to become a pro angler there is nothing holding you back. At least you should at least try. Jay stressed that he is always thankful to live in a place where we have the freedom to pursue such a dream. Going on, Yelas emphasizes, “It is important to try, but one needs to be realistic.” He recommends that you give yourself a time frame to either make or break your career. Jay spoke of guys that come out and they just love the sport so much that they can’t say no. They keep fishing even though they go deep into debt and might create family problems at home. They just stay out there year after year and their lives are in ruins over it. “I think the right way to do it is maybe give yourself three years or so,” says Yelas. His reasoning is that if you are good enough and you have a natural ability, in three years you will see the fruits of your labors. To him that is plenty of time to prove yourself. Jay feels that it is important to be realistic in your expectations. He recommends that you give it a shot but at the same time do not just keep after it forever. It could get to a point where the effort hurts you financially or hurts your family life. On the subject of family life, I asked Jay how he manages to balance a career in fishing and yet have a family life while on the demanding tournament trail. “The thing that helps me,” says Yelas, “is that fishing is my full time occupation.” When I am not at a tournament, I am at home with my family.” He points out that most tournament anglers have to make a living with a regular job and then fish tournaments on the weekends. It is then that he uses all his free time away from his family. That is what he sees at the real tough part of tournament fishing. All that time on the road gets old. It is the toughest part of being a pro fisherman according to Jay. It is especially hard for the guy with a young family. “Those are the toughest years,” laments the pro. When he first got married, Jay’s wife traveled with him all the time and they had fun. When the kids come along the angler is more tied down. Although he does not do it, one option is home schooling. Jay’s kids attend regular school but in the summer they travel with him to every tournament. During the regular school year they come with him to one tournament per month. This means that they lose about five days of school per month. He feels it is worth it as it is a way to get as much family time together as possible. Yelas believes that tournament anglers need to make family time a priority. He is quick to point out that you have to work at it. He is on the road about 240 days per year so if he did not bring his family along some of that time, then he is hardly ever going to get to see them. “I have to make quality family time a huge priority with both his wife and children,” says Jay. Other wise he is convinced there could become problems in the relationships. His success in winning the Bassmasters Classic has not only changed Jay’s professional life but also his family situation. The first thing it did was create even more demands on his time. If you are a champion everybody wants you to come speak at their event. He tells people it changes your life like getting married or having a child. The changes include how he has to prioritize time. “It is not that your wife and kids become less of a priority,” says Jay, “it is just that you are not the classic champ all the time.” It only lasts for a year and you have to take advantage of that to do a lot of promoting for your sponsors. It is important that you try to help them capitalize on the win. It is a great time for the sponsors as it gives them a lot of credibility for their products when you win a world championship. But it is still a drain on your time available for family and other things. As you become more successful, you also become more recognizable. The public wants part of your time too. They want to talk fishing and it is important to respect and respond to their desires. Always try to give them at least a minute of your time. The flow of the Tennessee River northwest across western Tennessee just does not seem logical. Rivers do not flow north they flow south. Or at least that is what we learn in grade school. Flowing north out of Pickwick Lake through the western portion of the volunteer state, the Tennessee River provides a variety of angling experiences for fishermen before it empties into the Ohio River near Paducah, Kentucky. We find excellent areas for fishing on the map but seldom fish them. Any number of creeks feed into the river as it winds across the state. Other areas, such as the tailwaters below Pickwick Dam, at Paris Landing and again in Kentucky Lake are very popular. The fishing is so good that it supports the angling pressure without damage to the resource. The fluctuating waters levels influence the fishing success on this river. As Tennessee Valley Authority (TVA) stops releasing water at a dam, the water levels drop along the river and back in the creeks. When they resume releasing water again, the level rises. As the water rises the fish actively feed again. Down river of the Pickwick Dam are Indian Creek and Hardin Creek. Indian Creek is about five miles below the Saltillo ram and Hardin Creek is about another five miles down river. Both enter the river from the east. The water from Indian Creek is usually clear, while that from Hardin Creek tends to be somewhat colored. There is access to each of these rivers from the main channel. It is, however, somewhat narrow. Both open up more once one is into the creeks. Kentucky bass and Largemouth bass like these creeks and can be taken with a jig and pig or a spinnerbait. Continuing on, the 25-mile stretch between Perryville and Clifton does not get a lot of angling pressure. It is a good choice for anglers at this time of year. The main channel is great for Kentuckies while the larger creeks hold good populations of largemouth and crappies. One of the better locations can be Beech Creek, which opens into a large lake as it runs back about seven miles from the main river channel. 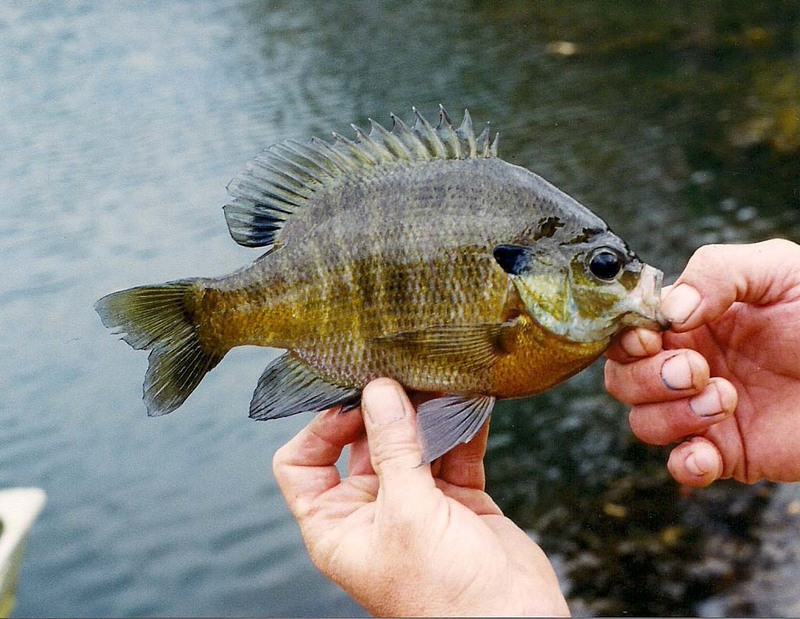 Spinner baits, plastic worms or crankbaits are fished near channel stumps and buck brush in 2 to 4 feet of water to find largemouth and crappie up to two pounds. Generally, bass stage in the river current until water levels reach about 359 at the Perryville gauge. At that point they begin to move back into the creeks. Sometimes large numbers of bass will stage at the mouth of a creek and later move in to spawn. 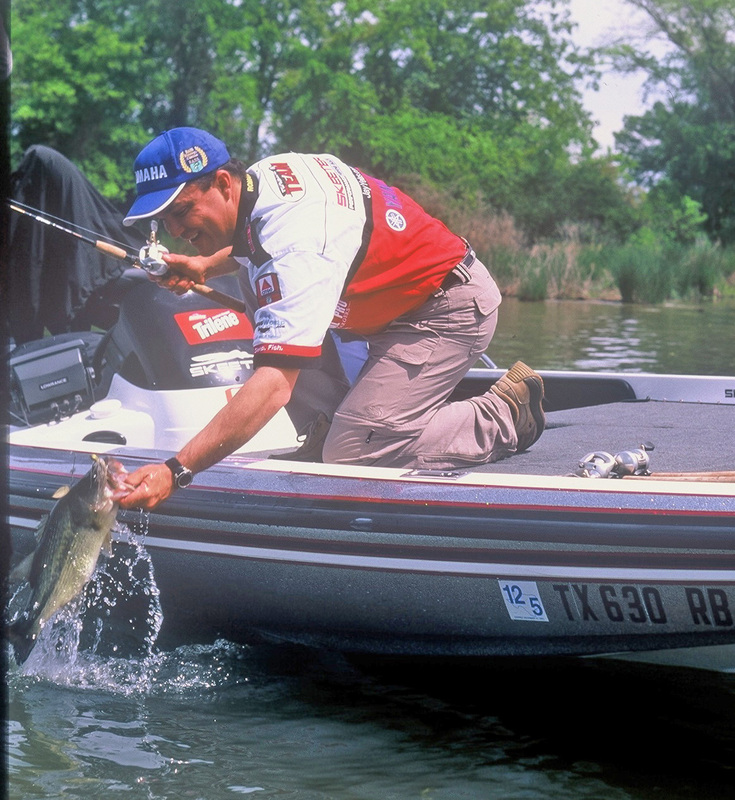 Locals usually begin at the creek mouth with crankbaits or a Texas-rigged worm. They work back up the creek until they find fish. Once you establish a pattern on one creek, it will be the same in most of them. Crappie angles usually find fish near laydown brush piles close to steep banks. Vertical jigging or casting produces steady action. Kentucky bass are usually along the west bank of the river across from Powell Branch Creek. Anglers make long casts toward the rock walls from out in the river. Lures work off the rock ledges all the way to the bottom will find fish that hit on the fall. Quarter to 3/8 ounce jigs with chartreuse/glitter or chartreuse with red tail grubs work well. Continuing down river one comes to Kentucky Lake with all of its structure and creeks that enter the waterway. It also contains a lot of artificial structures along the banks. Brush structures congregate fish and are an important in impoundments with little bottom features. The best locations for them are on drop offs, underwater stream channels or points that extend out into the lake. All of these are available in Kentucky Lake. They may be made of concrete blocks, old tires, clay flue tiles, stake beds, logs or other materials. The most productive seem to be those made of hardwood brush. Usually they are a bunch of tree branches tied together and weighed down with concrete blocks. The branches provide small fish refuge and food. Fishermen who know where these structures are, has a jump on the field. It is doubtful that anyone knows the locations of all the structures in the lake. At this time of year, bass migrate into the shallows. Early in the day shallow running baits are best. As the water warms, fish move to areas near blow downs, brush piles, treetops, stumps and other structure. Following any rain, the water tends to have a little color which draws the bass from deeper water into the shallows. Lures with sound are good in these conditions. On the lower end of the lake, good concentrations of fish are near the main river channel. Good locations to fish are Harmon’s Creek, Cypress Creek, Trace Creek, Big Richard Creek, Sulphur Creek, Turkey Creek, Bass Bay and Bennett Creek. 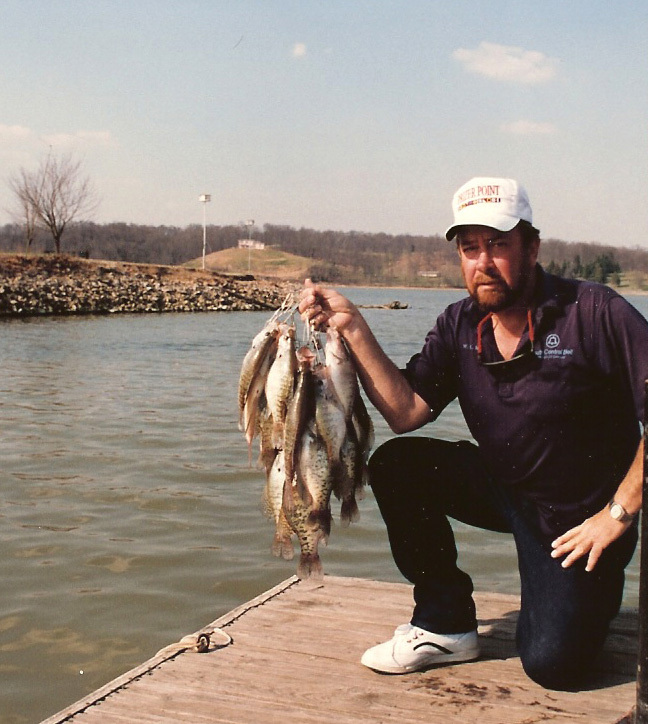 Kentucky lake crappie start the spawn as soon as the water temperatures begins rise into the low 50’s. They are usually catchable with jigs and minnows in the brush, trees, and stick ups along the shoreline. 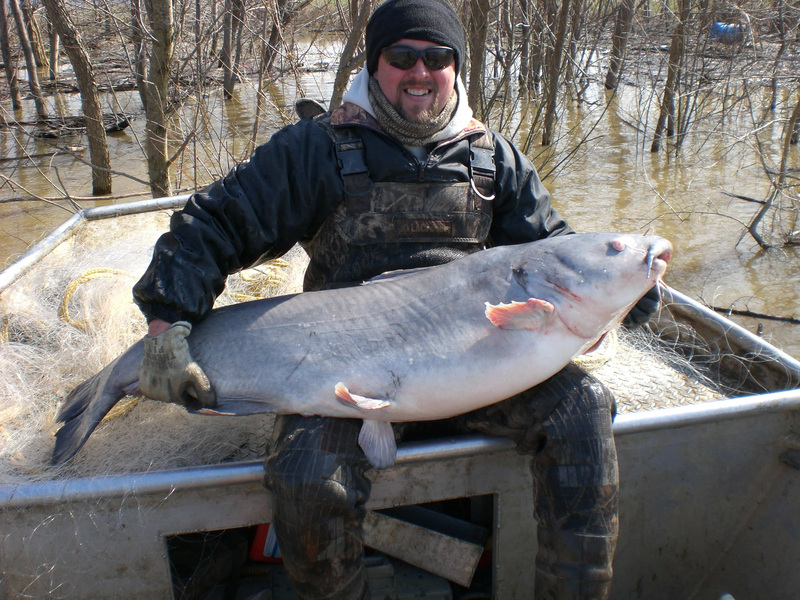 Catfish are usually in 15 to 20 feet of water near the rip rap close to Danville Bridge the later part of April. Locals use bottom bouncers with night crawlers and cut shiners. The Tennessee River is a good fishery all year. In the spring fishing is excellent it’s entire length. There are many resorts, tackle shops and public access areas all along the river. Anyone who does not take advantage of this opportunity is missing a good bet. Wabash River catfishermen find a magnificent gladiator which will challenge the skills of the best angler. The placid face of the river conceals a fishery unmatched in other area streams save the Ohio River. When a bobber disappears beneath the surface only to reappear for a second or two there is one of two fish ready to do battle. The Wabash flows some 200 miles between Indiana and Illinois along the southeast border of Illinois. Old broken dams, rocks and riffle areas offer excellent fishing for catfish. The water is accessible from ramps on either the Illinois or Indiana side. Annual surveys by the Illinois Department of Natural Resources and creels checks have long shown a healthy population of blue, flathead and channel catfish. By allowing baits such as chicken livers, worms, etc. to drift into the holes and other structure from upstream, the fish are enticed to bite. In many areas, anglers can wade and cast into the submerged wood in the water. Frankland recommends the old dam and its shallows at Mt. Carmel, in Wabash County as an example. He has taken as many as 40 channel catfish per hour while doing shocking surveys. Old dams like the one at Mr. Carmel once harnessed the power of the Wabash River. Today, the Wabash is the longest undammed river east of the Mississippi. The wide, flat bottomlands along the river are peaceful and fall away to the gently rolling hills in the distance. Wisconsin glacial episode nearly 22,000 years ago is responsible for the formations. Another good location is near Mauine, Illinois in White County. Frankland points out that there “is a railroad bridge about 2 miles south of town with three islands.” “Channel catfish can be found where the shallow water dips into a hole,” says the biologist. At New Haven, in Gallatin County, there is a boat ramp on U.S. Route 141. The water just above the boat ramp is good for channel catfish according to Les. In performing his duties, Les has taken good numbers of fish from the holes in the river. Downstream, there is an old dam and more good catfish habitat. Surveys of the river held in recent years show good populations of flathead and channel catfish over 3 pounds through out the river. Blue cats in the lower 50 miles of the river are in good numbers as well. Anglers report taking trophy flathead and blue catfish over 50 pounds in weight. The peace and tranquility of the Wabash River is deceptive to the catfish angler. The quiet lulls one into thinking that nothing will disturb it. Catfish may just change ones thinking about that scene. Turkey hunters have a great tool at their disposal in the GPS. Their maps and programs can help the hunter plan his hunt as well as navigate to and from hunting areas. A GPS can aid hunters in remembering all of the major scouting points (waypoints) in the woods and make locating them easier. It is possible to find a blind or planned ambush point in the dark easier than playing a video game. GPS stands for Global Positioning System, a system of satellites far above the earth. It measures your distance from the satellites with radio signals, and then shows you where you are. All the high tech stuff is handy in a small hand held receiver. All you have to do is turn it on, tell it where you want to go and follow its lead. 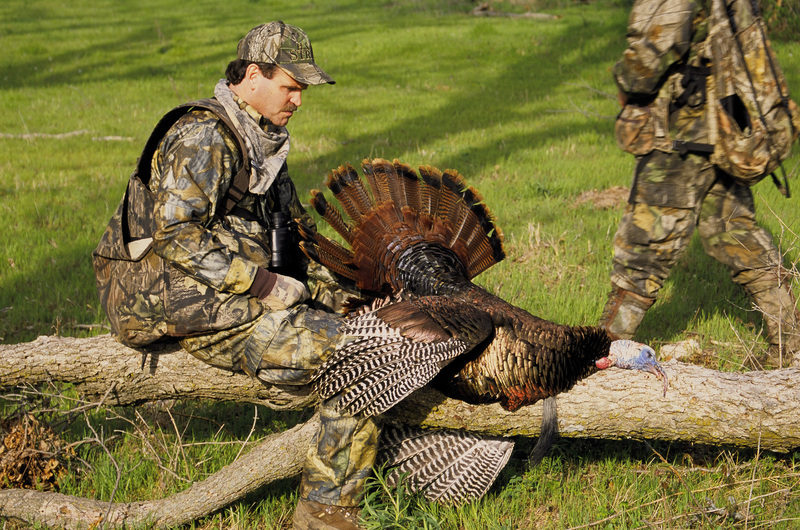 How do hunters overcome the natural defenses of turkeys? They use an intimate knowledge of the turkey’s habits, woodsmanship, stealth and calling ability. Most importantly is hunting in an area inhabited by the big birds. Pre-season scouting is the best way of finding the spots in a given area most often used by turkeys. Scouting with the assistance of GPS is one way to develop a plan of attack. Take a walk through the woods at dawn or dusk and listen for the birds to sound off. You can also drive the back roads stopping periodically to use a call. In both situations, watch for sign and birds. GPS will not overcome the major defenses of turkeys. The birds are agile and can instantly take-off vertically. Once airborne, they are capable of speeds up to 42 miles per hour. They present a formidable target. Perhaps a Turkey’s best defense is his eyesight. Just how keen is their eyesight can be the subject of considerable debate. But, they do pick up color, movement, contrast and detail very quickly and accurately. Turkeys perceive, analyze and react to what they see quicker than man or other animals. Turkeys also have better hearing than man. The fact that all of these defenses are in one bird creates more problems for the hunter when one considers that they travel in flocks. A half-dozen or more pair of eyes and ears presents a formidable challenge for most hunters. Once a tom is located, you add waypoint to your GPS. If it is late in the day, you can put him to roost. He will gobble often and make following easy. Once you find the roosting sight it too can be marked as a waypoint. If you find only tracks and droppings, they examine them carefully. If a tom is among the flock, his dropping will be long and J-shaped while the hens will be in a small roundish pile. Areas with mud or sand are good for seeing tracks. Larger ones in the range of 4 ½ to 5 inches wide between the outer toes will be from a gobbler. Add another waypoint to the GPS. Turkeys, like other birds, have problems with parasites. To rid themselves of these pesky critters, they take a dust bath. Find an area of loose dirt (dust) with turkey tracks and feathers. It most probably is a dusting area. Mark it as a waypoint on your GPS. Birds will visit it regularly. Soon you have formed a plan of attack for the turkey season. By looking at all the waypoints one can see a pattern develop as to the activity of the birds in the area. Use other waypoints to chart a course from a parked vehicle to and from the planned hunting area. Your present position appears as a symbol on the screen and any stored waypoints within the program are on display. As you move, the present position symbol tracks your movement and leaves a solid, dark line behind it that shows where you have been. In the dark pre-dawn and in heavy fog, this hand held receiver is a great tool for not getting lost. Sold under a variety of brand names like Lowrance and Magellan, the GPS receiver is about the size of a TV remote control. It can be stored in a pocket or daypack when not in use. They are available at sporting goods stores and through mail order catalogs like Cabela’s or Bass Pro Shops. GPS is a fast, simple and easy way to pattern the birds in your hunting area. It can get you on birds and make sure you make it safely back to your vehicle regardless of the weather. Cane pole fishing is a low tech way of angling and a great way to get kids started. For the older angler it is a fun way to revisit those bygone days of summer fishing. You can use a cane pole out of a boat, from shore, or from a dock. It works in rivers, streams, creeks, ponds and lakes. Due to its limber nature you notice the slightest jerk from a fish. A couple of sinkers keep the line tight. When a fish nibbles just jerk it straight up. Jerking hard and quick is best. The angler with a cane pole has to contrive to catch fish within the limit of their poles’ reach. That reach is only the length of the pole, less the grip portion, plus the length of the line. Without a float (bobber) this distance could be as much as 20 feet. But, as the bait sinks, the distance gets less as the bait swings in a pendulum fashion back toward the angler. Without a float, the angler can lower the pole until is horizontal with the surface of the water. That will place the bait roughly 10-feet deep. Using a cane pole requires the angler be quiet when approaching the fish due to the limit of their tackle mentioned above. This requires being able to read shoreline water and knowing where the fish are living. The shoreline also tells them what kind of bottom to expect. He looks for a particular type of shoreline. For instance he might look for short stretches of rocks and gravel. Or for largemouth he might pick the weedy shoreline in low places where black dirt and vegetation shows and where areas somewhere areas some distance from shore are over grown. The vegetation might be lily pads, cattails and rushes. The cane pole angler might overlook an area below a bluff since the area below would be perpendicular and go to a depth he cannot reach. It is important that he find areas of modest depth reachable by his equipment. That will serve as home to forage fish upon which game fish likely will be feeding. It is important not to spook feeding fish, especially in clear water situations. If the shallow area contains emergent vegetation or weed beds, the angler has some concealment and stands a better chance of getting closer to fish. The kind of bait used or strength of line varies according to the angler’s preference and species sought. The days of the cane pole as a favored way to fish are gone. But, it is fun to return occasionally and meet the challenge of this method of fishing. It is possible occasionally to find a cane pole along a river with an angler nearby watching the pole resting on a forked stick. Such anglers get to experience the peace and tranquility of a type of fishing that our forefathers knew well.